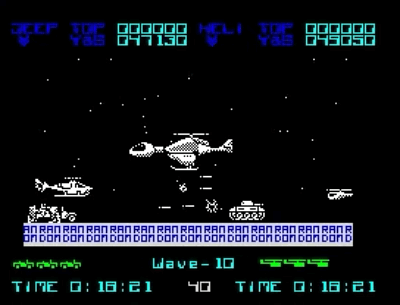 The first video clip features gameplay from the ZX Spectrum, and all of the clips on this page are from the original machines - not emulators. 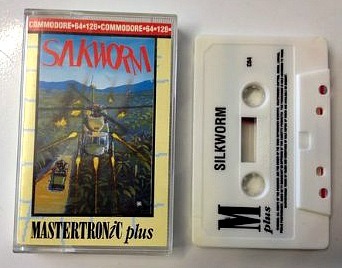 Sideways scrolling games were extremely popular back in the 1980s, and silkworm was up there with the best of them. 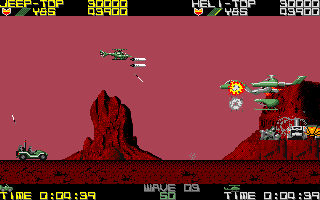 This fast-paced shoot-em-up was created by Ronald Pieket Weesenik for Tecmo and released on the Virgin Mastertronic label for the 8 bit and 16 bit home computers in 1989, after its success in the arcades during 1988. 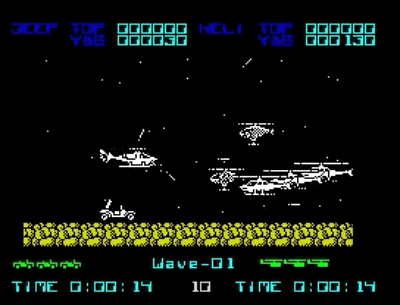 There were two modes of transport and in one player mode you could choose to control either the helicopter (this could fire forwards and downwards) or a jeep mounted with a machine gun. I actually found the jeep harder to control as not only did you have to destroy everything in your path, but also jump over obstacles - multi-tasking isn't my forté. In two player mode it was wise to keep the jeep behind the helicopter as the latter couldn't fire backwards. There were plenty of different enemies to deal with including huge tanks, heat-seeking missiles and transporters, but the most spectacular was the goose helicopter which was actually several small vehicles joined together - this was one huge beast and also very well armed! As with most games in this genre you also had to collect items to gain a higher score or improve your health. Power-ups included improved weapons and temporary invincibility. Points were awarded for each enemy killed. It was pleasing that the programmers had worked hard on retaining the speed of the original arcade version. The graphics were pretty decent for the time with interesting backdrops that scrolled smoothly across the screen. The realistic explosion and ricochet sound effects only added to the excitement. The difficulty level of the gameplay was perfectly set, being very challenging but not frustratingly impossible - believe me, there were plenty of games around at the time that seemed impossible to play. The music for the game was excellent, too, and created by Barry Leitch. He has composed music for hundreds of games and is still composing. During the 2000's he composed music for well-known titles such as Peter Jackson's King Kong, Splinter Cell and Lemonade Tycoon 2 - okay, the latter wasn't well known, I guess! The C64 version is impressive to watch. The graphics are about as close to the acrcade version as you're going to get on an 8-bit computer. The commentary for this clip is by Steve Benway who reviews old games "off the cuff", which is amusing to listen to. This is the first time he has played Silkworm.